Creating custom 1:18 scale resin model Professional Cars, including hearses, flower cars and ambulances. Ok, I've had a couple people ask for them...so I have decided to make available some FINISHED Criterion models. They are $54.99 + S&H. Just click the "Buy Now" button to the right or message me for an address to send a check to. Criterion resin body kits available! 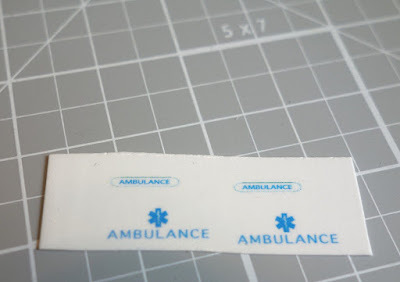 After many years of dreaming about it, I decided to make a model of one of my all-time favorite ambulances. The Miller-Meteor Criterion. 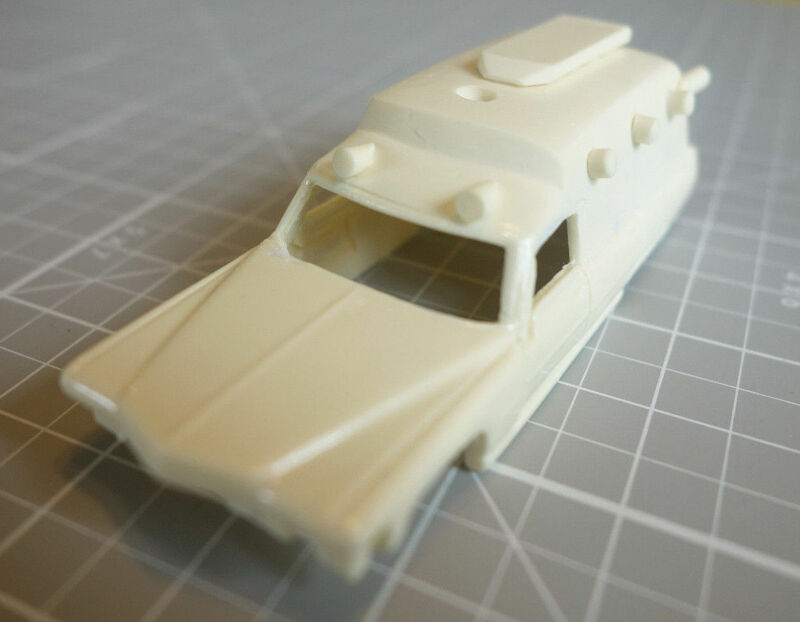 I started off with a 1:77 scale (by my calculations it's more like 1:85 scale...) Tomica Superior Cadillac ambulance. It's a pretty neat little diecast, so I was a little sad to cut it up, but hey, you gotta break a few eggs! I decided not to get too crazy with it, so I didn't worry about how the original model was a true commercial chassis length. And I decided to keep the original Superior rear door, because I thought it would look better than anything I tried to scribe in at that tiny scale. First thing I did was file down all the "Superior" details. Then taped off where I would use body filler to cover the windows and add some extra height to the roof. I did this so that I wouldn't fill over details I wanted to keep, like the door handles or window trim. After I had the body filler sanded to the shape I wanted, I marked where I would add small pieces of round styrene rod for the lights and scoop stretcher box. After this was finished, I built the car up on a temporary clay platform for when I poured Part 1 or my two part mold. With my two-part mold finished I was ready to cast the new resin body. After priming and painting the car white, I taped off the areas that would be painted orange. With the orange stripe painted on, I was ready to stick on the water-slide decals that I printed and paint the tunnel lights and rear bumper silver. With the lights painted and the decals added, I was ready to spray on some clear coat and reassemble the body and chassis. Well, they are finished! After hours and hours of assembling, dis-assembling, re-fitting, sanding, re-painting the chassis, the cars finally came together. I was very pleased with the results! Enjoy the pictures, the cars in these pictures are off to their new owners. I hope they enjoy them as much as I enjoyed building them. A view from the front seat, where I took out the gear shifter and put in a middle seat cushion to make a bench seat. I glued in the decorative panels, then the windows, then the interior door panels and finally the drapes over that. Got the tops all painted! Next update and the cars will be finished!! Then you can trim around the edges with a sharp #11 hobby blade. After that, press the edges down with a toothpick or cloth. After adding the rest of the Bare Metal Foil, I sprayed my clear coat over everything to seal the decals and foil. Here's another car with clear coat applied. After this the top just needs to be painted with a vinyl-like texture.